Each year the MakerBus team runs a kids summer camp as part of the Digital Humanities Summer Institute at the University of Victoria. After our first camp last year, there was tremendous demand to bring the camp back to UVic. During the second week of June we ran a one-week camp for 15 children between the ages of 7-12. All this month we’ll be posting reflections about the projects and activities we used in our camp. 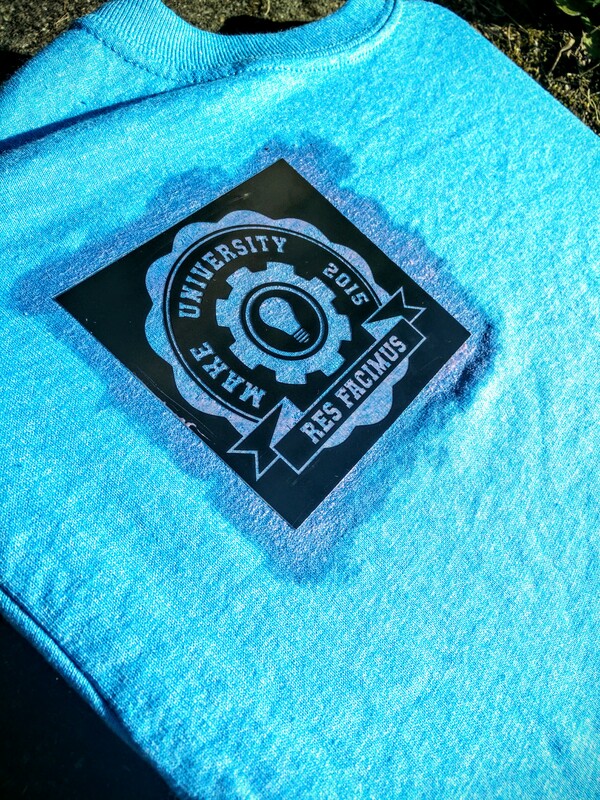 This year we wanted to bring a maker flair to the traditional camp shirt. Our goal was to create something cheaper than the traditional camp shirt that allowed our learners to express themselves creatively. To achieve this goal we decided to experiment with photo-reactive dye. Photo-reactive dye is pigment that reacts to light, allowing you to transfer images to fabric using a negative and light. We ended up trying a product called SolarFast. To use SolarFast you first need to create a transparent negative of the image you’d like to transfer. It’s important to use a negative image because the dye reacts to light, therefore, fabric under the darker parts of the negative will receive less light and receive less exposure. SolarFast sells transparent sheets for inkjet printers, but personally we found those sheets a little on the expensive side and opted to have our negatives printed at a local print shop. Most print shops can print onto transparencies and most will produce a better final product than a home inkjet printer. After we made our negatives (by inverting the original image in Photoshop and applying a black and white filter) and had them printed, we were ready to teach our learners how to make their own camp shirts. 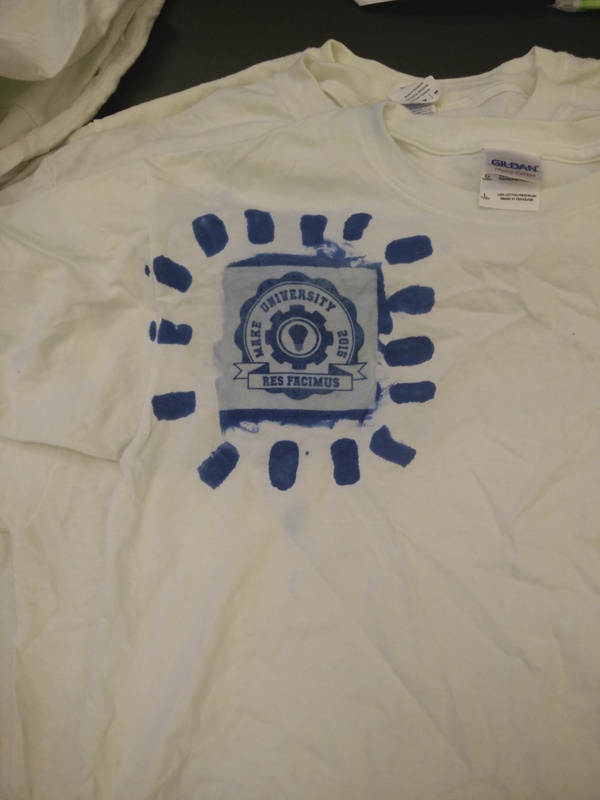 Each learner was given a negative, a white t-shirt, and their choice of one of three ink colours. They then had to paint the ink onto the area of the shirt they wished to apply the negative. Learners could also use the ink to paint patterns and designs onto the shirt. Once the ink was applied to the shirt, they placed the negative over the ink and left the shirt in the sun for 10-20 minutes. Hot water sets the ink and prevents the ink from exposing any further. While the learners were waiting we filled a wash basin with near boiling water. 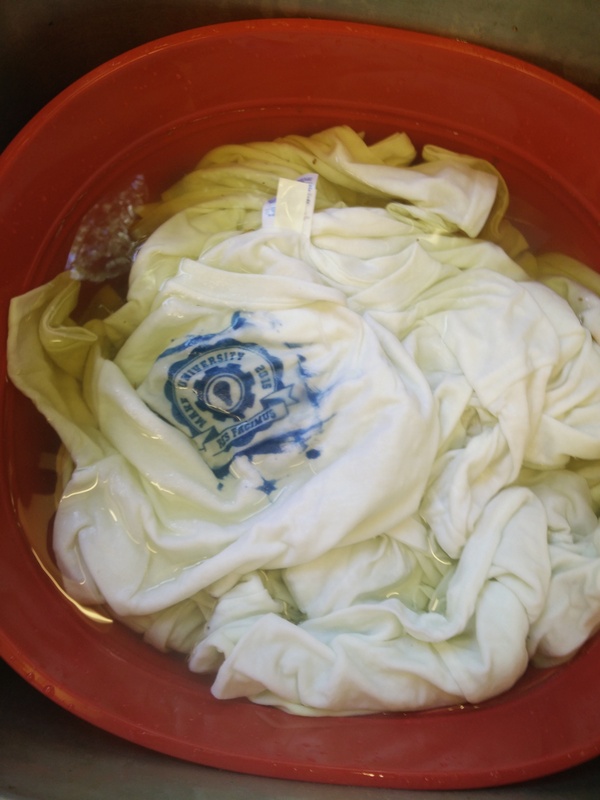 When learners were happy with the amount of exposure their shirt had received, they gave their shirts to us and we soaked them in the hot water. Since this was the last activity of the day we were able to take the shirts home with us and throw them into a dryer. Drying the shirts at high heat allows for the ink to fully set into the fabric. The next day our learners received their hand-made, personalized camp shirts. We were really pleased by how well the shirts came out. By making their own shirts our learners formed a much more personal bond with their camp shirts. We’ll definitely host more projects using photo-reactive dye this summer. 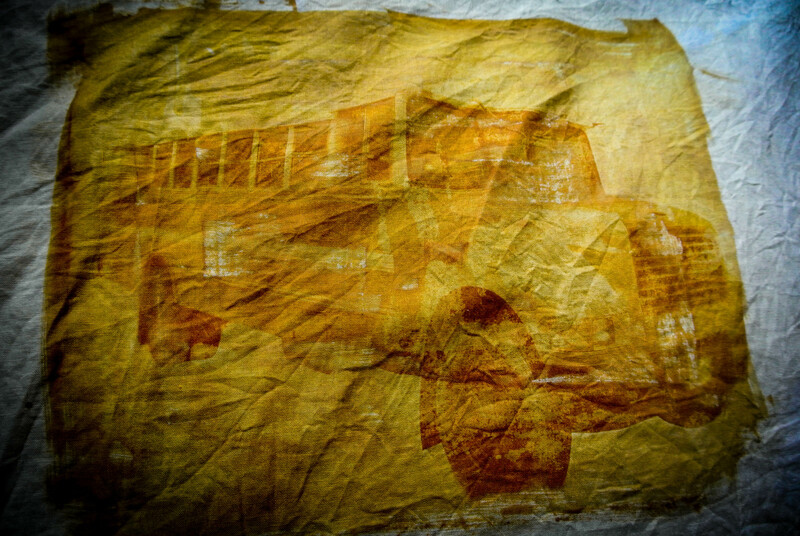 While we used a fairly simple graphic image, you can even transfer photographs using photo-reactive dye. We were playing around with the dye the other day and made a MakerBus tea-towel.